In recent weeks we have been looking at the rise and development of Newark industry from the days of Colonial craftsmen to the times of 20th century industrial giants. We have seen how industry rocketed the city into an American workshop and provided what Alexander Hamilton deemed so important, economic independence from outside forces. We have seen, though only in a most general sampling, the great variety of products that were, and to a reduced extent, continue to be made in the factories, forges and laboratories of the city. We have also attempted to look at how other forces within Newark assisted the phenomenal industrial output, which far exceeded other markets. The most essential helpmate was, and remains, transportation. Without the stagecoach, the canal, the river steamers, the multi-masted coastal river boats, the trolleys, buses, roads of all sorts, Port Newark, Newark International Airport and the monorail, we would not have been able to develop, exploit and sell our 'Newark Made' products at home and abroad. In each era transportation aided Newark in its development and gave the city an advantage that nobody else in the region possessed—flexibility. Indeed, if someone were to look critically at Newark and say what is the most important word in our vocabulary, or what one word best describes the advantages of Newark, my guess is that you could sum it all up in one word: transportation. When you are driving down the Turnpike between the great ocean-going ships from around the world, what is landing every 15 seconds? Or when you are driving into Newark along Route 280 late at night, how many 747s do you see stacked up ready to land at Newark, the jetliners coming in from Louisville, Lima, London and Lisbon? It's all here for the taking, a magic carpet to the world and a continuing incentive to build and develop in town. And while early industry and later its co-partner commerce made the city of Newark, the actual advantages of today may even be greater. True, manufacturing has declined, but the Newark Economic Development Program tells us that it continues to represent 17 percent of all private sector employment. This is indeed a healthy figure and by far the largest of any city in the state. Today, industry occupies a smaller but thoroughly sound portion of Newark's economy together with service industries, higher education, the cultural complex and the potential of a technology science park and all the advantages it can share with older industrial activities. This new combination offers a well-balanced economy not subject to the whims of a simple economy. It's terribly easy when driving around town or taking a train into the old Broad Street Station or Penn Station to see an antiquated red-brick factory with its casement windows replaced by plywood or view the ruins of an old zipper factory now ripe for demolition, and say the place is shot, and let's tear it down. But what you're looking at is only a part of the story. Today's eyesore may well become tomorrow's hot property. Then the Newark detractor might continue with a litany about the relocation of companies like Mennen, Johnston and Murphy, Ronson, Coats and Clark, Wiss, Ballantine and on and on. But, it's a free country, and as times and customs change, so do the reasons for locating a company. In fact, perhaps as early as the 1930s, while still in the Great Depression, there were inklings that a new Newark would come about. Certainly the great wartime factories brought increased wealth to Newark as well as problems in housing, transportation and the eventual pollution of our ground water, which we are now just learning to manage. Change also was accelerated in the post-World War II Newark with the return of its veterans and their G.I. benefits, the concept of the suburban ivy-covered cottage of the Truman era, and the Eisenhower era superhighways. The national highway system was designed for increased national security, not to aid commuters in getting to their dream houses in the hills. Railroads also served as drivers of change, and this was nothing new for commuters traveling between Newark and nearby communities since the 1830s. And while all this mobility seemed gradual, it wasn't until the 1950s that industrial decline became startling. The Newark Economic Development Corp. pointed out that between 1952 and 1975 Newark's manufacturing fell more than 50 percent, an alarming statistic for a city that prided itself for well over a century as the 'American Birmingham.' For the first time the service segment of the economy passed the manufacturing segment as Newark's prime employer. In 1986 there were 29,000 factory jobs in Newark, but by 1995 that level had fallen to only 18,000. On the state level, there was a similar decline in jobs, from 703,830 to 501,943. All in all, the situation was nearly identical with the state's, but it showed in Newark with the abandoned factories and littered loading docks, all compressed within the city's 24.3-square-mile confines. The decision to build Anheuser Busch's eastern processing plant in Newark is a good place to open Newark's modern industrial period. For $20 million in the early 1950s, Anheuser Busch overcame all sorts of difficulties and built its major East Coast facility here because of Newark's excellent transportation system, location within the metropolitan region, tax advantages and fresh water supply. The original 150-foot building with its 175-foot smokestack and giant landmark sign was not to be subject to any rulings by the Port Authority, which shared that section of town in the Newark Meadows. So happy were local officials when the plans were announced to soon employ 1,200 local workers, that a city-wide holiday was declared. Over the years, the brewery has expanded from an output of 1.2 million barrels annually to 5 million, and a recent $200 million renovation has resulted in boosting its brewing capacity. Today the Newark plant is the third-largest of Anheuser Busch's 12 breweries. 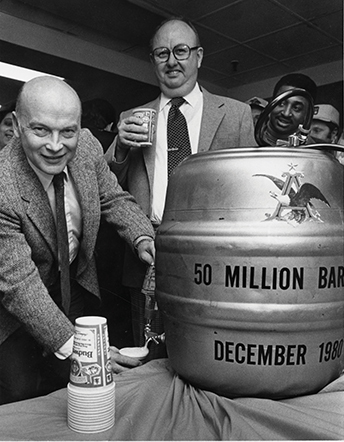 On December 23, 1980, its goal of 50 million barrels was achieved. In 1973, Toys `R' Us opened its $10.6 million facility on Doremus Avenue, where it manufactures, assembles, warehouses and ships toys all over the country. It selected its 92-acre Newark site because of 'excellent transportation, a large labor pool and federal, state and local loans.' In 1990, a Danish firm, Aarhus Inc., opened a $15 million vegetable oil refining plant at Port Newark, where it mixes palm kernel and coconut oils from Malaysia and the Philippines for export to East Coast companies including Hershey's, Mars, and Carnation. On May 1, 1998, The Star-Ledger announced on the front page that 'Newark goes better with Coke; New Ironbound plant would employ 1,100.' The Coca-Cola Bottling Co. of New York plans to build a $100 million bottling plant and distribution center in Newark that may eventually employ more than 1,000.' Year-long talks held by the mayor, the director of the Newark Economic Development Corp. and Coca Cola resulted in an incentive package of tax breaks, income tax credits and job training to bring the company to Newark. Construction of a 230,000 square foot warehouse is to begin soon and a 175,000 square foot bottling facility is to follow. As in the case of Newark's past and present brewing operations, the presence of large amounts of pure water also helped in the decision to locate in Newark. Announcements such as these are wonderful for those who hold Newark's economic future in their hands; however, there are many instances of equal importance that do not reach the paper's front pages. An example was a recent statement of NEDC's Alfred Faiella, that in the last 10 years his agency has filled nearly 4.5 million square feet with small, little-known manufacturing companies in factories that once housed large single operations. Two particular areas of development have been in the apparel industry and food processing, and while this accomplishment is not headline material it is certainly glorious news to those responsible for rebuilding, reviving and restoring life in the industrial sector, and for the Newarkers who find employment there. In 1996 there were 103 companies with sales of more than $1 million, 40 that sold between $5 million and $9 million, 37 companies with sales between $10 million and $24 million, 13 companies with sales between $25 million and $49 million, 4 companies with sales ranging between $50 million and $99 million, and one company with sales more than $500 million. Big-brand names that continue to carry Newark's name include Anheuser Busch, Shamrock Technology, Clinton Milk, Shofar/Kosher Foods, Cookson Pigments, Newark Boxboard, Seton Leather, Sherwin Williams, Benjamin Moore, (recently sold) Krementz and Co., and Troy Chemical. In spite of regional downsizing, changing tastes and shifting population, industry remains a basic part of the city's economy. From the days of 18th century industrial parades to an early nineteenth century map describing it as one of the 'most charming villages in America, where a third of its population is employed in the making of shoes' to a contemporary article stating that 'almost everything is made in Newark that is made by man, ' the old familiar words 'Made in Newark, New Jersey' remain good today.